« Obama the fraud. A Limerick. Obama and Chamberlain: Peace for our time. Our history tells us: Wage war is a crime. The peace-accord promised is not worth a dime. I clearly remember watching the latest Newsreel in our local cinema. It showed Chamberlain returning from Munich with the famous paper with Hitler’s signature on it. I was amazed to see most of the audience rise to their feet and start to clap and cheer. 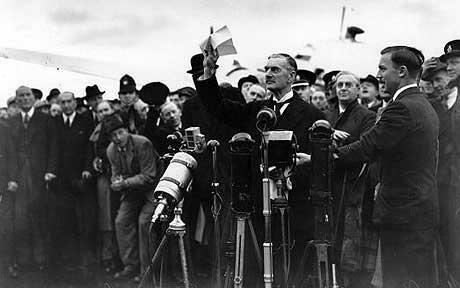 The majority of the population wanted peace and thought that Chamberlain had averted war. At the same time Churchill was booed by most of the audience. I was 15 years old at the time. This entry was written by lenbilen, posted on May 20, 2011 at 10:06 am, filed under Limerick, Obama, politics, Politics and tagged Appeasement, Limerick, Limericks, Obama, politics. Bookmark the permalink. Follow any comments here with the RSS feed for this post. Post a comment or leave a trackback: Trackback URL.